Northwest Corner Books, 9781941890264, 276pp. 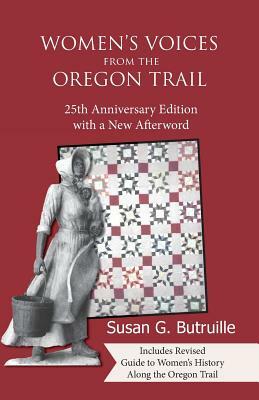 In Women's Voices from the Oregon Trail, Susan Butruille artfully narrates the lives and struggles of the women who followed the 2,000-mile trail to Oregon 175 years ago. This twenty-fifth anniversary edition not only retraces the women's journeys, but also brings their narratives to life in diary, song, history, poetry, quilts, and recipes. Beginning with the Midwestern farms where most of the women were from--and where so many started their journey by squeezing their families' lives into the tiny space inside a covered wagon--Susan follows their trek step by step. These women toiled across unforgiving landscapes, braving dangerous rivers and mountain passes, prairie storms and disease, to reach the strange and bountiful land where a new home was supposed to await. The author herself retraces this trail as it is today in Guide to Women's History Along the Oregon Trail, documenting where to find the markers, signposts, landmarks, and historical sites that still show the lasting impact of the brave women who uprooted their lives to heed the call of Oregon Fever.